Why ALPHABET should be a good investment. On Monday August 10th 2015, Google announced a major restructuring, creating what was effectively a new holding company with Larry Page and Sergey Brin at its helm. The new entity would represent a collection of companies. The largest of which would be Google, slimmed down a bit. The others would be further away from the core internet business. Current examples would include their health efforts like ‘Life Sciences’ (that works on the glucose-sensing contact lens), and ‘Calico’ (focused on longevity). There would also be a focus on developing new ideas too. 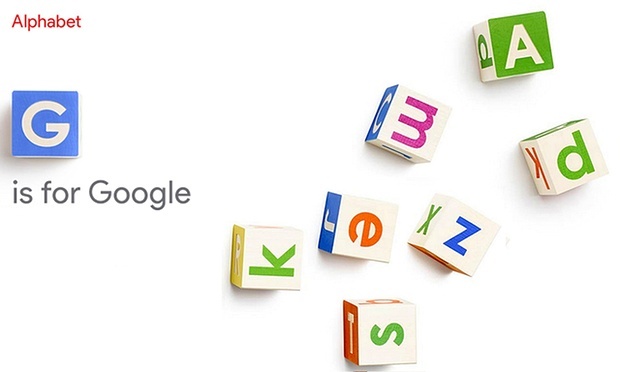 Page and Brin announced that the name for this new company would be “Alphabet”. Every new name has its detractors; I remember the comments about “Ace Ventura” when Accenture was announced so I wasn’t surprised to hear a few wags saying that the reason that Google had chosen Alphabet was an attempt to outdo the notion of “A is for Apple” and the A-Z in Amazon. Conveniently, Alphabet would also come before both in any alphabetical index. So as a name for a company charged with finding and developing winning and highly profitable innovations, it makes sense and probably made the decision easier. Created to answer a personal request of the honorary chairman, deemed unlikely to sell because it lacked a key product feature, with a name that senior management actively disliked, it went on to be a worldwide success that has helped shape the music industry, selling millions and millions of units worldwide. The name, like Hoover or Sellotape, came to define the category and is listed in the Oxford English Dictionary. The brand is Sony Walkman. Sony introduced the Walkman in 1979 but its origins can be traced back well before then. In the 1950s the first portable cassette recorders came onto the market but, like many hi-tech products, they were targeted at a professional market and not the general public. The main users were journalists who could afford the high prices for the equipment and the specialised micro-cassettes, which at the time weren’t used in the music industry. Sony called theirs Pressman. In 1962, Philips invented what became known as the Cassette tape, though it was more formally labelled and trademarked as a Compact Cassette. Philips’ subsequent decision, interestingly in the face of pressure from Sony, to license the format free of charge led it to become the dominant tape in the market. 1964 saw both the introduction of the first pre-recorded music cassettes and Philips Norelco Carry-Corder 150 portable recorder/player. By 1968, 85 manufacturers had sold over 2.4 million players despite the sound quality being only mediocre. The quality improved dramatically by the early 1970s and the Compact Cassette went on to become increasing popular especially as it provided the ability to re-record. In 1978, Sony launched the TC-D5 a portable cassette player and, while general sales were limited due its high price, the lack of suitable lightweight headphones and its relatively large size, it did become a favourite amongst many of the senior people in the Sony company due to its high quality sound. One regular user was Masaru Ibuka, co-founder and then Sony’s honorary chairman. He used the player to listen to operas on his many airplane trips, but he still found the player too heavy for everyday use. He instructed the tape recorder division to create a smaller version for his personal use. The division, led by Kozo Ohsone, modified a Pressman to do the job. They removed the record function and added stereophonic sound. Ibuka was immediately impressed and suggested that they bring a similar item to market. It was a well-timed suggestion, Sony’s tape recorder division was flagging. So it was that in February 1979, Akio Morita, the company’s other co-founder, demanded that the engineers develop a player similar to the one they had developed for Ibuka but it had to be more commercially viable. He also told them that he wanted the product by June 21, 1979. With that demand ringing in their ears and worried that the division would be consolidated into another one if they failed, the engineers went to work. They took a pragmatic approach and designed a portable tape player based on Ibuka’s modified Pressman player but using lower end components to bring the price down and encasing it in a small, stylish enclosure. There was still the problem of the headphones. The current ones were far larger than the new player itself, they weighed more than 400 grams. Luckily for the team, three years before, engineers in another division had designed a lightweight pair of headphones. They eliminated the large, enclosed earpiece and in its place put soft foam. They weighed in at around 50 grams. They were quickly added to the new design. The device now needed a name. “Walkman”, a variation on the Pressman was suggested. It is said that Morita hated the name “Walkman” and feared it would not catch on in the US and Europe. Alternatives, like “Walky”, “Freestyle” and “Soundabout” were considered, and even tried in other countries, but ultimately the name Walkman stayed. 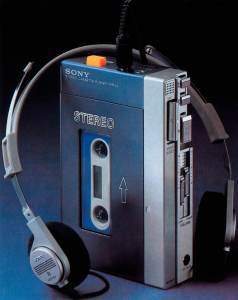 Having met the deadline, Sony announced their new product to the trade press on July 1st 1979 – a truly personal and truly portable 14 ounce, blue-and-silver cassette player with chunky buttons, headphones and a leather case. It also had a second earphone jack so that two people could listen in at once. The reaction wasn’t encouraging. Some claimed that nobody would be interested in a tape player without a record function. Others pointed out that the most popular tape recorder of the time had sold less than 15,000 units, yet Sony had produced 30,000 units. Sony however decided to press on and the Walkman was announced to the public. A month after the Walkman became available in Japanese stores, it was sold out. 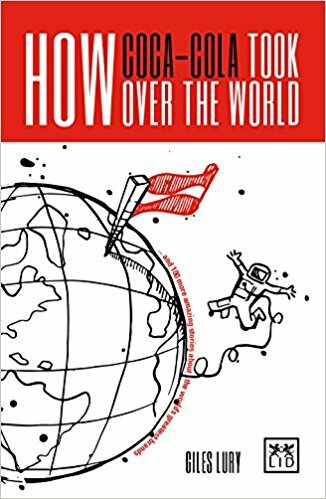 It went on to be a success right around the world. In the next decade, Sony sold 50 million units, and competitors who copied the idea sold millions more. Herbert Johnston, an engineer at the Hobart Manufacturing Company was a curious man, or rather he was a man who was constantly curious. He was one of that band of engineers who want to use their practical skills to solve other people’s problems. So, when in 1908 he saw an over-worked baker working away to mix bread dough with nothing but an iron spoon and brute force, he thought that there must be a better and more efficient way of doing it. It took him nearly seven years to develop an 80-quart electrical stand mixer but when it was introduced sales grew rapidly, saving bakers’ arms up and down the country. It came to the notice of the procurement department of the US Navy and they ordered mixers for two new Tennessee-class battleships, the California and the Tennessee, as well as the U.S. Navy’s first dreadnought battleship, the South Carolina. By 1917, the stand mixer had become “regular equipment” on all U.S. Navy ships. The product’s overwhelming success prompted Johnson and the other Hobart engineers to think about the potential for a smaller model that might be used in the home kitchens. World War I interfered, and while the battleships benefited from the mixers, the American public had to wait until peacetime returned. The KitchenAid trademark was quickly registered with the U.S. Patent Office. The H-5 was also the first in what was to be a long line of KitchenAid stand mixers that utilized a “planetary action,” a revolutionary design that rotated the beater in one direction while moving it around the bowl in the opposite path. It wasn’t a small unit though, standing about 26 inches (33cm) high and weighing approximately 65 pounds (29.5kg). Many retailers were initially hesitant to carry the unique product so the company turned to its own largely female sales force, who set out to sell the 65-pound H-5 door to door. They gave in-home demonstrations to groups of women demonstrating how the machine could mix, beat, cut, cream, slice, chop, grind, strain, and freeze and sales quickly grew. Then in the 1930s the company hired Egmont Arens to design three new, more affordable stand mixer models. Arens was the Art Editor of Vanity Fair, as well as being a world-renowned artist, designer, and “industrial humaneer” championing a consumer-centric approach to product design and packaging. His client list included G.E., Fairchild Aircraft, and the General American Transportation Company and indeed the Hobart company for whom he had designed a meat slicer. Arens’ design for the 4½-quart-capacity Model K45 was sleek and modernistic, far ahead of its time. It remains virtually unchanged to this day. It was released in 1937 to huge success. All KitchenAid components are compatible with the front attachment hub of every mixer made since that day. One final and famous innovation wasn’t actually introduced till 1955, when at the Atlantic City Housewares Show, KitchenAid unveiled a range of colours including Petal Pink, Sunny Yellow, Island Green, Satin Chrome, and Antique Copper. So if you are like Herbert Johnston, and are naturally curious and you had ever wondered about the origins of your KitchenAid, now you know. How does a brand that sells kitchen gadgets by that most impersonal of channels, direct mail, and conducts no market research become a beacon for best practice when it comes to customer service? Well it starts with a founder’s belief that you should ‘always look after the customer and the business will look after itself’, it goes on to include an inspirational customer service director and continues with a truly dedicated and committed sales force and a loyal group of brand advocates. Alan Rayner was the founder and his initial business was selling agricultural plastics; covers for haystacks, silage sheeting, Lammacs – plastic coats to protect new-born lambs and, most famously, plastic bags for chickens. The business, originally known as Lakeland Poultry Packers, is now known simply as Lakeland. In 1974, when Alan retired, his three sons, Sam, Martin and Julian Rayner, took over the business. One of the first things they did was to change the direction of the business. It was a decision that laid the real foundation of the brand today. Home freezing was the ‘in thing’ in the 1970s and the brothers had “A moment of inspiration [that] told us people who froze food also cooked it! So along came the ‘Everything for Home Cooking’ catalogue. We scaled down the agricultural side and headed in the direction of all things kitchenware”. It was to prove to be a great decision. Although they admit that they never got on particularly well as children, the brothers seem to be a harmonious team, each with a distinct role suited to his talents. Julian Rayner, who describes himself as ‘very visual’ is the company’s marketing director and takes charge of catalogues and shop design. He describes Sam as the brains: “He understands the computer system” and so he was the natural choice for managing director. Martin is ‘a man of infinite patience’, which makes him ideal for running the buying side. It’s a company constantly looking for and bringing new products to the market. 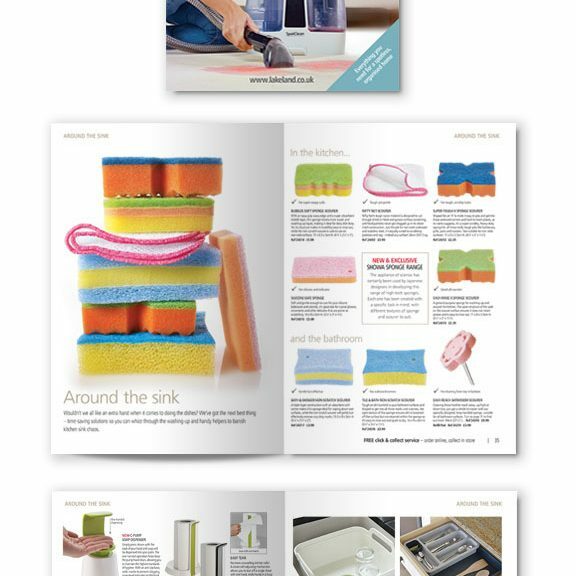 It puts out up to 18 catalogues a year, containing 3,500 products related to homeware, cleaning, crafts and Christmas. 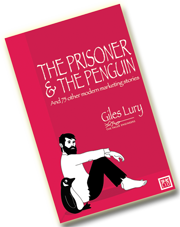 It has about 70 stores in the UK and a thriving internet business. sent to the Czech manufacturer and trucks to fetch the product. Not long after the brothers took over the business, Michelle Kershaw joined them. She quickly learned everything there was to know about home freezing and kitchenware and became their resident expert and the face of Lakeland. Never much of a cook, Michelle had a passion for cleaning. Every Friday, she would take home a bag full of products and test them over the weekend. If she thought something was ‘crap’, she would say so, but, if it did its job, she wanted to tell her customers. Lakeland customers were her friends. They rang her when their dogs died, they came to visit her in Windermere and sent cards. If they found a wonderful product on holiday, they couldn’t wait to get back and tell her – the soft liquorice from Australia that is selling by the ton started as a customer suggestion. This meant that the company didn’t, and doesn’t, need to conduct formal market research as it talks and listens to its customers on the phone, constantly. Michelle was diagnosed with lung cancer in March 2003 yet, despite her illness, she continued working long hours. She was told that she needn’t and shouldn’t come in before 8.30am, but she came in early as always. Later that year she was given the Lifetime Achievement Award for services to the home shopping industry. On the day before she died in 2004, Michelle was driven to the office in the afternoon. Too weak to get out of the car, she checked proofs in the car park. Next morning, her last act was to finish a customer letter. When told of her death there was a huge, heartfelt out-pouring of grief from customers.